Unseating at least 24 Republicans, Democrats will have the majority in the House for the first time since 2011. Democrats claimed control of the House late Tuesday and flipped at least seven governorships, but Republicans were poised to expand their majority in the Senate, delivering a split verdict in the first national referendum on Donald Trump’s presidency. Trump’s racially charged warnings about illegal immigrants and demonization of Democrats appeared to mobilize enough Republican voters to withstand the “blue wave” the party once feared. The president helped Republicans win hotly contested Senate races in Indiana, Missouri, North Dakota, Tennessee and Texas, and proclaimed the election’s outcome a “tremendous success.” Republicans held their grip throughout the South and in rural and exurban areas. But Democrats – propelled by a rejection of Trumpism in the nation’s suburbs, and from women and minority voters especially – notched victories in areas that just two years ago helped send Trump to the White House. In the high-turnout election, Democrats performed well across much of the upper Midwest and even in ruby-red Kansas, where Laura Kelly was elected governor over the president’s handpicked candidate, Kris Kobach. In Wisconsin, Democrat Tony Evers bested Gov. Scott Walker, once a Republican star who ran for president in 2016. Walker survived a hard-fought recall vote in 2012, and was reelected in 2014, only to be denied a third term by the state schools superintendent. Incumbent Republicans fell in an array of suburban House districts, including the one held by House Rules Committee Chairman Pete Sessions in the Dallas area. And in West Virginia – where Trump is wildly popular and campaigned heavily for Republicans – the reelection of Democratic Sen. Joe Manchin delivered a personal blow to the president. Returns early Wednesday showed Democrats poised to pick up more than the 23 House seats they needed to gain a foothold in Congress from which to counter Trump. Democrats were projected to flip at least 29 districts currently held by the GOP, while they were on track to surrender only a few seats in the chamber. With power in Washington divided, House Democrats are likely to try to block the president’s agenda and use their subpoena power to investigate him and his administration. “Thanks to you, tomorrow will be a new day in America,” said House Democratic leader Nancy Pelosi of California, who is poised to reclaim the speaker’s gavel she lost eight years ago. Rosen, who by early Wednesday was the lone Democratic challenger to fell a Republican incumbent in the Senate, cast her victory as a counterpoint to the racist and anti-Semitic rhetoric that had marked the closing days of the midterm campaign. “After all the hate, all the hate that I’ve seen recently, that we’ve all seen, I can’t tell you how much this means to me as a former synagogue president,” Rosen told supporters in Las Vegas. If the candidates were to wind up below 50 percent, they would go head-to-head again in a December runoff. 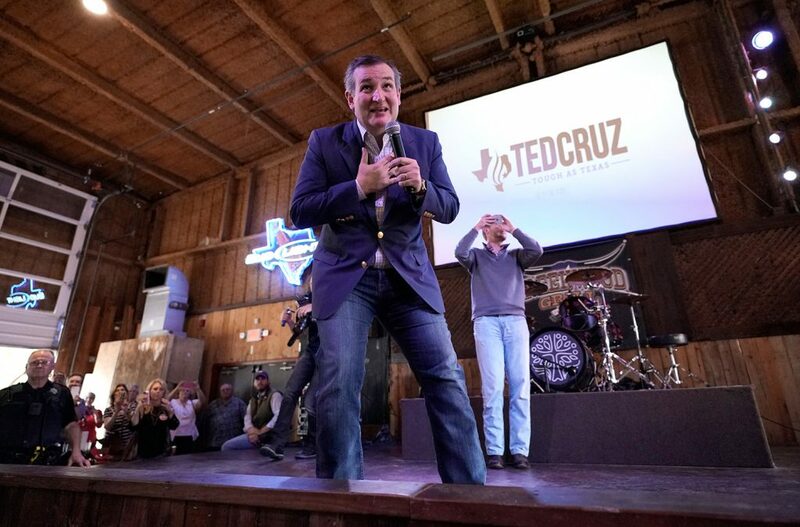 Another Democratic star, Rep. Beto O’Rourke of Texas, lost his spirited challenge to Republican Sen. Ted Cruz despite raising record sums of money and attracting grass-roots support throughout the country. The Senate results underscored just how much the Republican Party has morphed into the party of Trump. The incoming freshman class of Republicans is made up largely of Trump allies – including Mike Braun in Indiana, Josh Hawley in Missouri and Kevin Cramer in North Dakota – who campaigned effectively as rubber stamps for the president’s agenda and owe their new jobs, at least in part, to his energetic campaigning on their behalf. “Without him, I don’t think we would have had the night we had,” Sen. Lindsey Graham, R-S.C., who has transformed himself from one of the president’s sharpest critics into one of his most stalwart defenders, said on Fox News. An exception is Mitt Romney, who handily won his race for the open Senate seat in Utah, marking a return to the national stage for the party’s 2012 presidential nominee who in 2016 denounced Trump as a “con man” and a “fraud.” Following the death of Sen. John McCain of Arizona, and the retirements of Sens. Jeff Flake of Arizona and Bob Corker of Tennessee, Romney is poised to become the leading GOP counterweight to Trump on Capitol Hill, if he chooses to stand up to the president. They were part of a wave of female candidates on the Democratic side, including Jennifer Wexton, who easily unseated Republican Rep. Barbara Comstock in a closely watched race in Northern Virginia, and Debbie Mucarsel-Powell, who narrowly defeated GOP Rep. Carlos Curbelo in South Florida. “This resistance began with women and it is being led by women tonight,” said Sen. Elizabeth Warren, D-Mass., who easily won reelection and is widely expected to run for president in 2020. But the Democratic momentum was not strong enough to carry some prized recruits over the finish line. Former Marine fighter pilot Amy McGrath, who attracted significant outside funding, lost to Republican Rep. Andy Barr in Kentucky. In Ohio, another state Trump carried two years ago, Democratic Sen. Sherrod Brown cruised to reelection and cast his victory as a road map for Democrats to reclaim the industrial Midwest, though Republican Mike DeWine won the governorship there. In two other Midwestern states that Trump won – Wisconsin and Michigan – Democrats fared better than they did in 2016. In Wisconsin, Sen. Tammy Baldwin (D) was reelected. And in Michigan, Sen. Debbie Stabenow won reelection and Democrat Gretchen Whitmer was elected governor.